We first heard about LG's upcoming Q9 smartphone a few hours ago, when a purported list of its most important specs got outed. And now a hands-on image is out, allegedly showing the device in all its glory. The LG Q9 has an 18:9 display with no notch and rounded corners. There's a pretty significant chin and none of the bezels are really very slim for today's standards. Then again, depending on its price at launch, that may be tolerable. 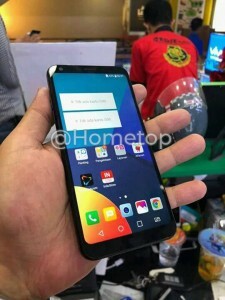 The source of the image speculates that we may be looking at an FHD+ panel, while the phone should arrive in India for a price of around INR 20,000. According to the previously leaked specs, the Q9 will pair the Snapdragon 660 chipset with 4GB of RAM and 32/64GB of storage. It will run Android 8.1 Oreo and have a 3,550 mAh battery in tow. I hope it has a fingerprint scanner. Who said the owner are complaining on G7? The online portal Flipkart list it with 4.6 (out of 5) rated per customer. Only the number that LG should worry about and think ahead. P.S: Even reviewers recommends G7 over OP 6 (128 GB).